Make your inquiries by e-mail or at website and receive the CIF price by e-mail. If the vehicle has been under offer to another customer, the vehicle may become available to you later. Please contact us in a few days. Or you can find another vehicle and make inquiries again. If you agree with the CIF price, request Proforma Invoice(P/I) and Purchase Agreement(P/A). We will hold the vehicle for you up to 48 hours from the time we issued the P/I and P/A. 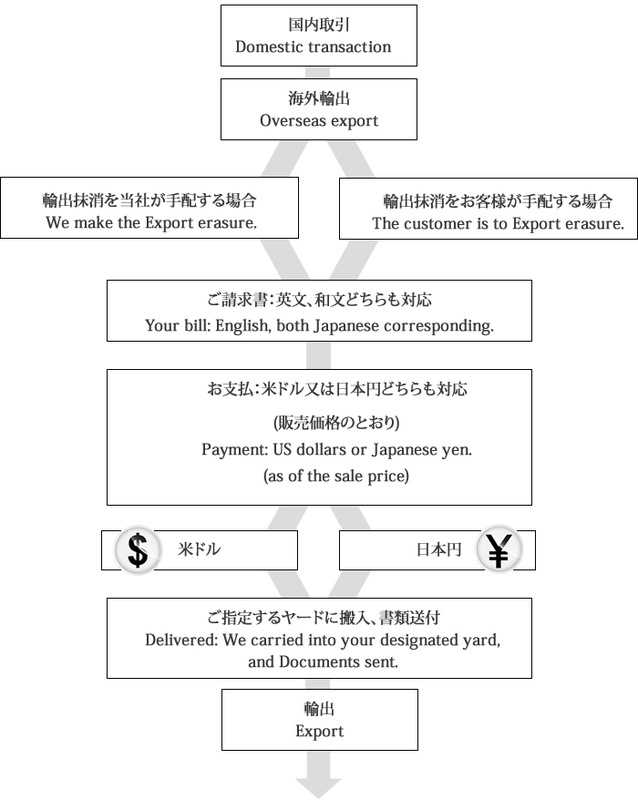 After we acknowledge the receipt of your payment, we will re-confirm the followings by email: your Consignee (owner-to-be for the vehicle): for B/L your Notify Party (person who receives the notice of ship's arrival): for B/L (Bill of Lading) your Documents Destination Address (DHL delivery address) We need Full Name, Full Address and Phone Number for ALL of the above. After re-confirming the above with you, we will book your vehicle on the ship sailing to the port of your conveniences. We will send you the shipping schedule around the ship's departure date(s). Please be informed that the ship's name / schedule are subject to changes due to shipping company's reasons and they are beyond our (BF's) control. These are expected changes in this business. Shipping company will send us B/L documents 10-12 days after the ship's departure. We will send you PDF file of the B/L documents by e-mail. Please CHECK THE SCAN VERY CAREFULLY. *You may not be able to amend the B/L once we send it out to you. After receiving your confirmation on the PDF file of the B/L documents,we will start sending out the documents to you by DHL. Your bill: English, both Japanese corresponding.